I had started to wonder if we were going to see this card at all this season, but here it pops up on All Souls Day and the last of three days that can be called the Day of the Dead. While we should live in the now, it’s good not to forget the lessons we can learn from our ancestors and beloved dead. Most of us do not have perfect ancestors, but we are a result of the love they had for others (even if it wasn’t permanent) and for us. Blessings! 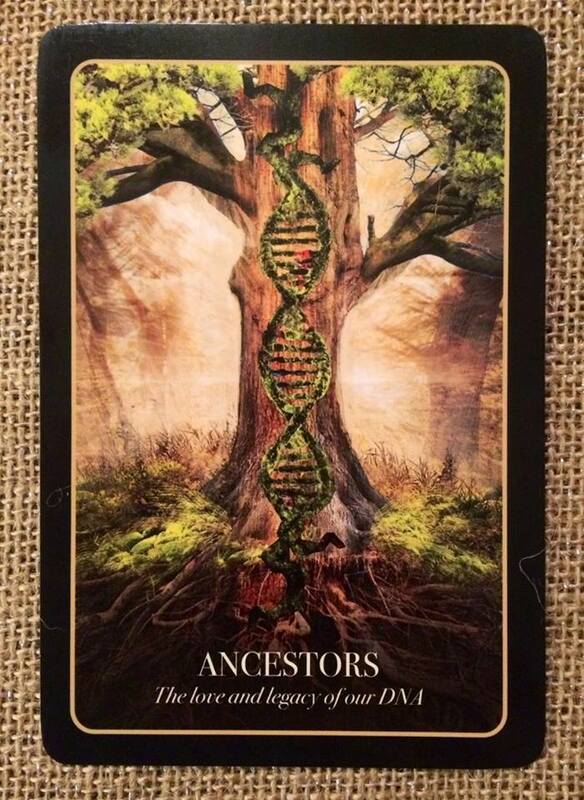 Whether or not we know our ancestors, we are the product of those who have lived before us, DNA-wise. Externally, we may have the body type of our father, our mother’s eyes, our grandmother’s nose, our great-grandfather’s skin tone. On the inside, it gets even more interesting. We know now that we can “inherit” the way our body works, blood types, genetic disorders, even propensities for aspects of brain function like introversion, musicality, and mathematics. Many Pagan paths associated with Halloween believe that we are born perfectly imperfect to be exactly what we are meant to be. What does this mean? It means that the gifts our ancestors left us and the unique synergy of the combination of the physical, mental, and physical that is created within us, sets us up perfectly to achieve our ultimate purpose. Should the Ancestor card bring itself to your attention, know that you are ready and able to action your birthright of power. You have the support of those who came before you. There may be challenges or struggles but you have everything you need to overcome them. You will prevail!